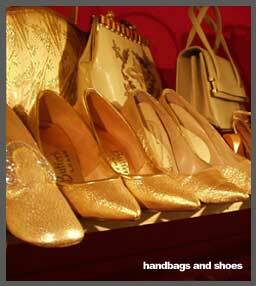 IF YOU'RE LOOKING for vintage shoes, handbags and accessories, look no more! Our unique collection covers everything from spikey 1950's high heels to 1940's platforms to 60's mod heels to leather and suede boots and more. We have vintage 1930's and 40's beaded purses, many in white glass beads with French handcrafted pettipoint flowers and beautiful frames. OUR COSTUME JEWELRY COLLECTION ALONE fills six display cases and includes pearl necklaces and earrings, crystal necklaces and drop earrings, brilliant rhinestones and bracelets. We also stock vintage silk scarves, stockings and long white leather gloves. Come in today and discover these and other vintage treasures at THE FAMILY JEWELS!